The main issues of the election are the state of the economy, endemic corruption, and the wide range of security threats across the country. These security issues may make it difficult to organize polls in some areas, particularly in the northeast where Boko Haram and the Islamic State have caused large-scale displacement. The culture of patronage and role of local figures in mobilizing support for national races has led to Buhari and Abubakar making key connections to political leaders across the country, contributing to national tensions on a local level. The risk of political violence will rise significantly after the election when the results are released and could translate to clashes between party cadres as well as violence directed toward state authorities. This is most likely in Rivers, Akwa Ibom, Kaduna, Kano, Plateau, and Adamawa states. Reported or perceived irregularities in the presidential election would likely result in unrest in Lagos and Abuja as well. Those operating or residing in Nigeria on February 16 are advised to avoid nonessential travel to the vicinity of election-related facilities as well as any political gatherings due to the possibility of unrest. In July and August 2018, more than 30 senators and 90 representatives defected from the ruling All Progressives Congress (APC), mostly to the opposition People’s Democratic Party (PDP), including Senate President Bukola Saraki and former Vice President and current PDP flag-bearer, Atiku Abubakar. President Muhammadu Buhari was elected as the APC presidential candidate for re-election amid the party convention held in Abuja in October. 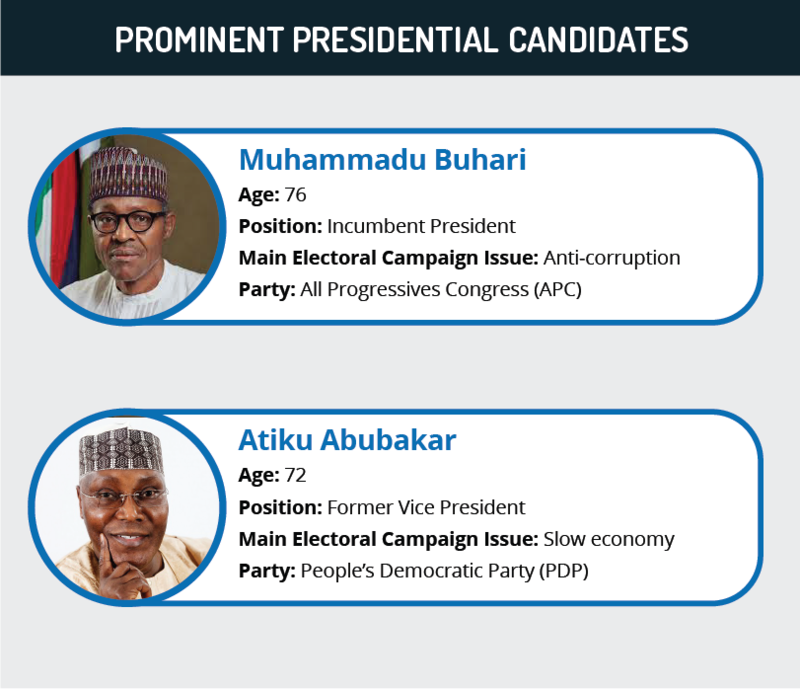 Likewise, Atiku Abubakar was chosen as the PDP presidential candidate in a primary election. On January 3, Amina Zakari was appointed as INEC’s head of the collation center of the elections, triggering allegations of misconduct by the PDP given that she is related to President Buhari. On January 25, Buhari announced the suspension of the Chief Justice of Nigeria Walter Onnoghen over corruption allegations, sparking the PDP’s condemnation over what they claimed was the APC’s attempt to “influence” the judiciary before the election. This led to PDP demonstrations and a 72-hour suspension of the campaign in solidarity with Onnoghen. Reports indicate that over 120 people were killed during the month of January 2019 due to banditry and subsequent security operations in Zamfara, Katsina, and Sokoto states. Political tensions and violence have always been a common feature of Nigerian electoral processes, both at the national and regional level. In fact, Buhari’s ascension to power in 2015 represented the first peaceful transition of power between the ruling party and the opposition in the country’s history. Nonetheless, political unrest did take place during the campaign period as well as in the aftermath of the elections. In the current campaign, these tensions were evidenced relatively early on by the brief siege of the National Assembly by security forces in August 2018 in order to allegedly allow the impeachment of Senate President Bukola Saraki following his defection to the PDP. Additionally, there was high-level unrest during the Osun gubernatorial election between APC and PDP cadres in September 2018. This not only illustrates the deep-rooted volatility of Nigerian electoral periods but also sets the precedent for a highly contentious election on February 16. There is a range of issues concerning Nigerians ahead of the polls, primarily the economy and security of the country. This includes the general stagnation of the economy and how it is intertwined with endemic corruption. Despite being the largest economy in Africa as well as an oil producer, Nigeria is believed to be the country that is home to the largest number of people living in extreme poverty, at 87 million. This is coupled with high levels of unemployment at more than 23 percent in 2018. This is exacerbated by corruption at all levels of government, including the federal government, judiciary, and local institutions nationwide. These have been widely debated on the campaign trail. In addition, the multifaceted security threats are a core issue. This includes widespread criminality and kidnappings-for-ransom nationwide, cultism in the south, intercommunal violence between farmers and herders in the Middle Belt Region, and conflicts between bandits and vigilante groups in Zamfara and northern Kaduna states. Finally, there is the consistent threat posed by Boko Haram and the Islamic State’s West Africa Province (ISWAP) in the northeast, particularly as ISWAP has shown increased capabilities in recent months, with attacks in December and January that have left thousands displaced. 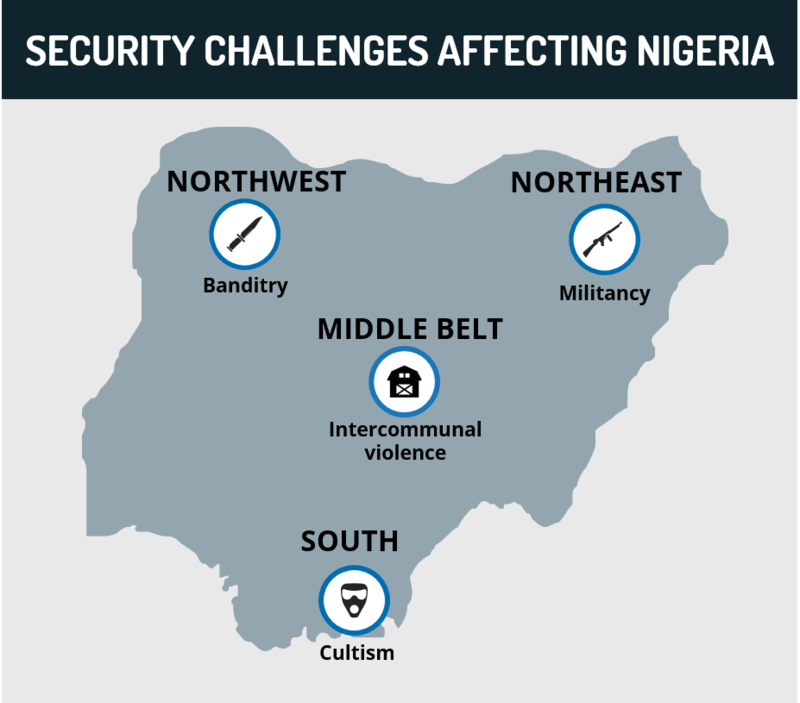 FORECAST: The northeast in particular faces not only the threat of attacks during the polls but also the logistical challenge of holding the elections in areas dealing with the displacement of people, which will likely impact electoral turnout. While militant groups have not issued any specific threats associated with the elections, many of the areas’ 400,000 internally displaced persons (IDPs) will be voting inside of IDP camps across Borno State, some of which are areas that are heavily targeted by militants. With corruption as a major issue of the election, President Buhari has attempted to capitalize on his reputation of being “incorruptible” during the campaign. His image as a watchdog and the active anti-corruption practices instituted during his tenure have been key to this. Buhari is also assisted by his popularity among peasants in northern Nigeria, who play a key role in the electorate, as a result of his origins in Katsina State. In tandem, his running mate Vice President Osinbajo’s popularity among ethnic Yoruba and others in the southwest region help to bolster this support. On the other hand, one of Buhari’s primary challenges are the doubts regarding his fitness in office given that he is already 75-years-old and has spent prolonged medical leaves abroad. Finally, the state of the economy is likely to affect his support nationwide, while rising insecurity may undermine him in states that he won in 2015, such as Borno, Adamawa, Benue, Kaduna, and Zamfara. Atiku Abubakar as centered his campaign on his ability to revitalize the economy due to his experience as a successful businessman. He has also pointed to his political experience, as he served as Vice President under Olusegun Obasanjo between 1999-2007. He has sought to contrast his approach to security with Buhari, promising extensive reforms within the security sector to combat criminality, banditry, and militancy. In this context, he received the public support of several prominent generals who had supported Buhari in the 2015 election. Abubakar’s choice of running mate, Peter Obi, an ethnic Igbo, was likely a strategic effort to mobilize voters in the southeast, as seen when influence Igbo sociopolitical group Ohaneze Ndigbo called upon Igbomen to support Abubakar. However, Abubakar has already faced allegations of corruption and questions over the source of his enormous wealth during his vice presidency. Another concern for his campaign will be his poor electoral history, as despite his victory in the PDP primary election, he failed in his attempts to run for president in 2007 and 2011 as well as in the 2015 APC primaries. The regional and ethnic connections already made by Buhari and Abubakar point to a key dynamic in Nigerian politics. Given the country’s size, federal structure, and entrenched corruption, there is a dominant culture of patronage where the support of local figures plays an essential role in gaining support in important areas. Part of the presidential campaigns’ efforts has been to find local figures capable of mobilizing voters. Kano State exemplifies this dynamic as it has the largest number of voters alongside Lagos State, making it an important battleground. Buhari won Kano with 90 percent in 2015 and counts on the state governor, Umar Ganduje, who vowed to deliver “at least five million votes”. However, Abubakar has gained the support of a former Kano governor, Rabiu Kwankwaso, who is still regarded as an extremely influential figure and holds the potential to significantly reduce the margin of victory compared to 2015. President Buhari also has a solid level of support in the North West and, to some extent, in the South West, though the North Central region has always been regarded as a “swing” zone that often decides the elections. Buhari won this area in 2015 with 56.2 percent, but North Central encompasses the states most affected by intercommunal violence between farmers and Fulani herders, especially Benue, Nasarawa, and Plateau. With Buhari widely criticized for what those in the region perceive to be a soft stance against Fulani herders, he has the potential to lose a considerable number of votes. FORECAST: As the elections draw nearer, and given the culture of patronage and political clientelism across the country, tensions are expected to rise ahead, during, and especially after the polls. While there are some instances of conflict, such as the alleged inability of Rabiu Kwankwaso to hold PDP rallies in Kano due to pressure by the APC-supporting state government, this is likely to worsen. Although there have largely be isolated cases of unrest thus far, the risk of violence will rise significantly in the days after the election when the results of both the presidential and local polls have been released. This unrest is expected to translate to scuffles between party cadres, as well as violence directed at state authorities by the losing party and their supporters. This is most likely in states with a long history of political violence, such as Rivers, Akwa Ibom, Kaduna, Kano, Plateau, and Adamawa states. These tensions have been fueled by both parties, as the APC have alleged that the PDP is mobilizing armed groups to influence the vote while the PDP have raised questions regarding the independence of the electoral commission as its president, Amina Zakari, is a relative of President Buhari. Moreover, the suspension of Chief Justice Onnoghen close to the polls raised further suspicion by the PDP. These suspicions of vote-rigging, intimidation, and the widespread practice of political clientelism illustrate the overall political climate in the country. FORECAST: In the event of contentious results on a local or national level, demonstrations and unrest are likely in the above states as well as in Lagos. If there are reported or perceived irregularities in the context of the presidential election, protests with a strong potential for unrest are liable in Abuja, particularly in the vicinity of the Supreme Court, electoral commission, and other central locations. Travel to Abuja, Lagos, and Port Harcourt can continue while exercising increased vigilance and adhering to stringent security precautions regarding criminal and security threats. Those operating or residing in Nigeria on February 16 are advised to avoid nonessential travel to the vicinity of polling stations, tallying centers, and other election-related facilities due to the possibility of unrest. We further advise to maintain heightened vigilance in the week following the polls and avoid nonessential travel to the vicinity of any demonstration that may arise due to the risk of unrest. Hey Buddy!, I found this information for you: "Elections to take place on February 16 amid violence in several regions – Nigeria Analysis". Here is the website link: https://www.max-security.com/security-blog/nigeria-general-elections-to-take-place-on-february-16/. Thank you.